Hey everyone and welcome to A Bright Corner. Thanks for stopping by on the Quiltmaker's 100 Blocks Road Rally! We're now on day 2 of the blog tour (see info for day one here), and it's my turn to share my block! I love their rectangular shape, and the various colors you see in all of the facets. I used a jelly roll of Vintage Picnic (Bonnie & Camille for Moda Fabrics) and with some strip piecing this quilt came together quickly! This quilt measures 60" x 72" and uses one jelly roll, 1-1/4 yards for the corners, and 3-1/2 yards white / background fabric. And I love the scrappy feel of the blocks! Aren't they fun? Now who's ready for a giveaway? There'll be two winners! 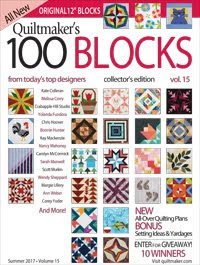 First of all, Quiltmaker Magazine is giving one of you a copy of Quiltmaker's 100 Blocks Vol 15! 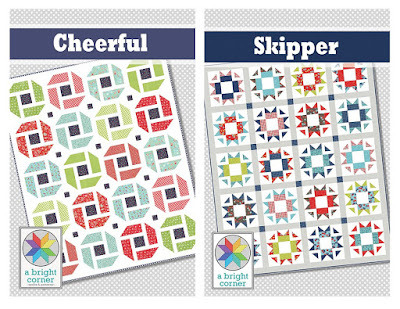 One other lucky reader will also receive a copy of the magazine, plus two of my quilt patterns - Skipper & Cheerful. Giveaway has ended - thank you! To enter the giveaway, leave a comment below telling me what you like to listen to on a road trip! Movie soundtracks? Talk radio? Favorite CDs? Nothing at all? As for me, I love listening to audio books! --Open to international readers too! 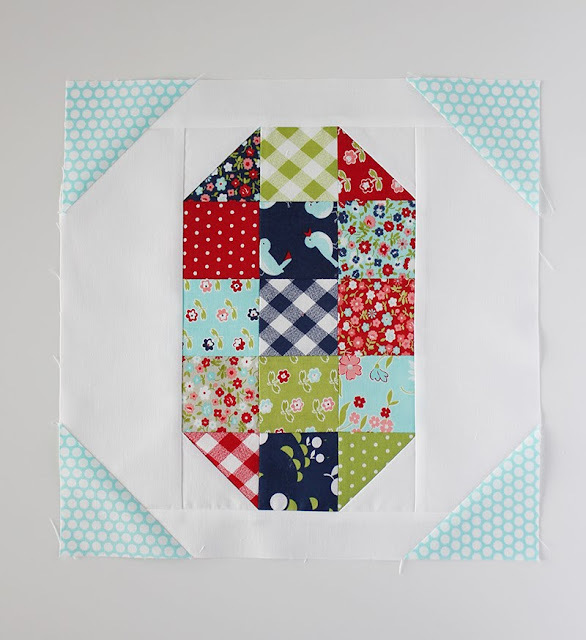 Make sure you stop by the Quilty Pleasures Blog to see more of the blocks from this issue, and to enter more giveaways! The Road Rally continues until May 5th. And to keep up to date on things happening here at A Bright Corner you can subscribe to my blog, and follow me on Facebook and Instagram (@abrightcorner). Thanks for stopping by! Nice block, sure to be used as scrap buster! My hubby says I drive him nuts when we travel together. We listen to music with the occasional talk radio...until the discussion makes me mad, that's when I start driving nuts, talking to the radio and changing the station. Best block of the day I think. Anything goes for me. I like talk shows in different areas. I have a medically challenged special needs child and travel is difficult so I don't travel much. But if I am alone, I don't listen to much. I like the peach and quiet. Gives me time to think. My house has 7 people in it, including a 4 year old. I also have nurses daily and teachers coming and going all the time, so my van is my sanctuary. I love to listen to audio books but when travelling and others are in the car we usually listen to radio. Thanks for the chance to win. On the road I listen to the talk radio. Nice Block and great design!! Beautiful - both quilts in solids and prints are gorgeous! Especially love that it uses 2.5 squares :)! I love listening to CD's in the car and when I'm sewing! Thank you for these giveaway chances! I like to listen to talk radio. I love your block in a scrappy version. Thanks for a chance to win. Beautiful block! I love both versions very much! On the road I love to isten to e-books too! Love your scrappy version! I like listening to music, but my husband likes listening to podcasts when we travel, and since he does the majority of the driving, that's what we listen to! Peace n quiet. Time to reflect n unwind and enjoy the scenery! Great block! I listen to radio stations along the way, a nice variety of talk and music. I like long trips because then there is time for a mix of listening. My preference is instrumental music or audio books. If my children are present, they want to sing : ) Your block is so nice! Thank you for offering this giveaway. We like to listen to audio books while we travel. thanks for sharing. We've a system where each person can choose what they want to listen to. The allotted time depends on the length of the trip. We draw for order (who goes 1st, 2nd ...) before we start out. I like hearing what my kids like to listen to, it has created some good teaching moments. Road trips by myself are always about music that I can sing along to. Andy, your block is great! Love it in B&C! I like to listen to audiobooks also. Love your block. My granddaughter would love the "charms" as she calls them. I like to listen to music. Love your scrappy block! Last summer DH and I drove 4000 miles and never once turned on the radio-so refreshing just to talk to each other or have total quiet. If I drive alone the radio with country music keeps me company. Usually on road trips I love the silence of driving, but on occasion a good podcast is welcome! Sooo pretty! Love the scrappy version. Thank you for sharing and for the giveaway. I listen to Country music---always. Whether it's a CD or a local station, I like to listen to rock music (especially 80s rock!). Love your blocks! I listen to XM as the quality of the sound is so good. My husband and I switch between 60s, MSNBC, Classical and top hits and Christian. Rather I switch he doesn't care. Love having XM in the vehicle we travel in. Love this block. I am deaf, thus, the silence. :-) Thank you for a chance to win. I like to listen to my favorite pastor teach through the Bible. I learn a lot. Thank you for the sweet giveaway! My mind is just spinning with ideas for this block! Thank you! I listen to everything on long road trips! A good audio book, my niece sings opera, country, jazz or plain ol' rock n roll will do just fine! 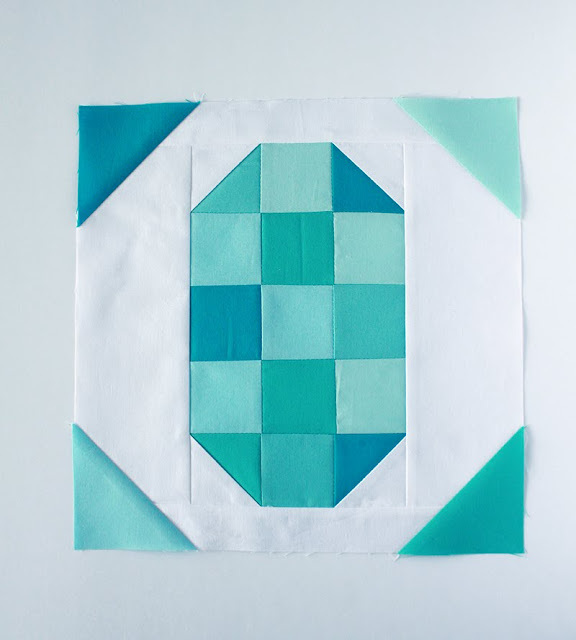 I just fell in love with your Aquamarine blocks and it just has to be those colors. Gemstones - what a unique quilt pattern. Thank you for being a part of the QM's 100 Blocks Blog Tour and sharing your inspiration with us as well as the chance to try and win a copy of this awesome magazine.I just got to make this for me now. Great Job! On any road trip I love audio books!!!! Either a new listen or one I have enjoyed before. I found I can cover 1000 miles straight thru the first day with a good Audio book. No I can not do 2 days in a row at a grand a day. Oh yes - the road trip. I love to listen to our Radio Station in Sonora, CA which is 92.7 or play a CD from Exile. They are an older group but I just love their music. The road trips I like to take are on the back of a motorcycle. So the only sound I hear is the rush of wind around my helmet!! Great Block!!! 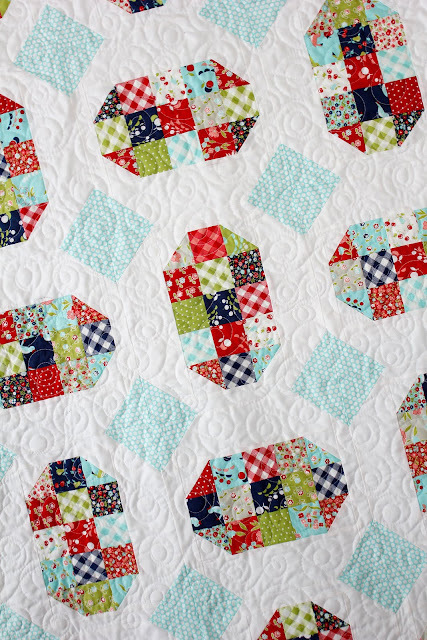 Really cute block, can't decide if I like the solids or scrappy, both are winners!! Thanks for sharing!! Road trips usually have music or silence (time for thinking). Thanks!! Ooh, that block is absolutely luscious done up in all of that shades of aqua. It really gives an illusion of gemstones when set in stark white like that. I can just see a tray of stones set out on a white tray for me to pick my favorite to be set into a stunning ring ! I want to save a picture of this quilt for future inspiration. I just have to decide what 'gemstone' I want to try to replicate ! Choices, choices ! Oh how good GOD is ! I like listening to the 60's. Love listening to music.... and ABBA always finds it was to the play list. Broadway musicals... but I'd end up tapping my toes and speeding so I'll let someone else drive! Love your inspiration of the quilt! Love the scrappy on white :) Lucky you, having sunshine in a basement level sewing room. So jealous! Congrats on a wonderful block!!! It's a must do!! I love the block, congratulations! My daughter is a cellist and a singer, so we usually end up listening to a cello concerto or the soundtrack of any musical. great block - it will be great in so many different kinds of fabric. but the cool aqua tones are my favorite. I like to listen to audio books when on a trip, as long as i'm not driving ( can't concentrate on the book! )and when driving I try to find a local pleasant radio station. We listen to CD's while we travel, if I travel alone I would listen to audio books. I have teal fabric to use, great block, and Nice to see it done scrappy. Thanks for giveaway, love your patterns. I generally listen to music if I'm on a road trip by myself. I usually pick oldies by someone like Queen or Dire Straits or Paul Simon but I also have a CD called "Zydeco Stomp" that's a good one -- New Orleans style music and very upbeat. I love to listen to soft rock when I travel just on the radio. We usually don't listen to anything (old enough we need to concentrate on driving). I like to listen to classic rock when travelling. I don't need to pay too much attention to it to know what it is. Fun block! I have Sirius radio in my car and I go back and forth between BB King Blues and Entertainment Weekly. We usually flip stations to find something for the moment. Then when that gets boring, we go to our playlist for a while, then silence, then circle around again. I like quiet in the car. I'm a listening to music CD's in the car kind of gal. I love your block as it is made up into a quilt. Change the color and you could change the name. I listen to audio books both at home and on the road. I download them from my library. I don't usually listen to much on a long trip. I like to have someone to talk to instead. I always need music that I can sing to, so Pandora or iHeart are great options. I can choose what genre I am in the mood for that day and sing all the way. I like to listen to CD's (mostly 80's pop/rock/metal) since radio stations cut in and out on long trips. Before going on a road trip, I always spend time selecting the CDs I'd like to hear. Generally an eclectic mix. We got hooked on audio books when vacationing with extended family. All the cousins wanted to hop into our van to visit (and listen to Harry Potter!). Love the block! Radio and CD music are my favorite ways to pass the time on the road-sometimes you just need to filter the backseat noise LOL! Great block - I love the scrappy version! I like talk radio in the car! Love the aqua version! I like to listen to 70's music, turn it up when I'm driving alone and sing to it. We usually end up letting the kids watch DVDs, so we're hearing the movie in the background. Otherwise, we do definitely enjoy soundtracks! We listen to oldies on either a compilation disk or itunes playlist. Traveling with my husband we listen to Hawaiian music. I do audio books on my long drive to work. Beautiful block! I love version you made using Vintage Picnic! When in the car I tend to listen to upbeat pop. I love your scrappy block version of the quilt. We usually listen to local country music stations. I love the aquamarine block! We listen to oldies - 50's through early 70's! Country music. Love your aquamarine block! We listen to classic country and classic rock and roll. Unless we are just listening to each other. Classical music, it keeps me calm, and sometimes my steering wheel can be a big drum for an overture! Classical music helps me remain calm in heavy traffic. Especially anything with violins and "Verdi", my favorite composer of the moment. On long trips I like goldie oldies I can sing along with much ferver. Keeps me awake. Love your new block. Thank you for this opportunity. Traveling alone I listen to audio books or 60' music. I listen to music, variations depending on whose turn it is to pick! I listen to talk radio and Cd's of music. I love listening to and singing along with John Denver. I usually scan the radio and see if I can find a station with songs I haven't heard in a long time, or songs that I've never heard. After a while, I will roll down the window and just listen to the sounds of the road. Love this block, it uses some of my favorite colors! I love listening to classical music and other favorite CD's. Favorite CDs and Bible messages are our favorite road trip listening. I listen to local radio when I'm traveling. I sometimes end up with stations that are not my taste but it's a way to learn a little more about the area I'm traveling through. I usually travel with hubby. Depending on the distance of the trip I enjoy talking with my husband along with catching up on my Quilt Novel Mysteries. I'm an NPR listener, and enjoy hearing those familiar voices in different parts of the country. And if I need to stay perky, I have a cd of familiar "car" favorite songs, mostly ones that were popular when I was in high school, and I can sing along. If I'm on a road trip to MN by myself, I bring audio books to keep me going. I'm a big-time audiobook fan. I listen on road trips, while walking (for exercise), while cleaning, and while quilting! The hubster and I alternate between classic composers and some of my favorite 70s rock. The rock keeps us awake! I love your block, especially in the prints! If I'm traveling alone, I listen to a book; if not, music. Your block is beautiful! thank you and congratulations! My husband and I like to listen to audio books on road trips - the one for our next road trip is The Martian. Thank you! I only listen to country music. BTW: I love your block. I like to listen to Christian music if by myself. But if I am with my husband we talk alot. We used to take a drive a long time ago to pat rent, just to talk to each other and catch up, we could have mailed a check. Love your block more after reading what inspired you! We like to listen to Contemporary Christian music in the car. Pretty block! I really like it made with prints. We generally listen to our favorite Praise music while we travel. Great block! Audible books...it makes a trip by myself pass by quickly, but if it's with anyone else...whatever's on Sirius XM. Love your block in the Aquamarine solids ! We bring along CDs -some that we haven't heard in a while. Andy, your block is so unique and lovely! I really like it and can't decide if it like it better in one colorway or the scrappy look...guess I'll have to try both! On road trips, we listen to satellite radio and mostly classic rock. Great block and beautiful colors. We usually listen to a mix of classic rock and classical music. It often the news and weather. what I love in the music world my husband does not. He is boom, boom and I may put him to sleep. He is driving, so loud is often to keep him awake. Your block to me reads a Easter egg. Usually the radio (we alternate between NPR and rock). This last trip I brought a Bluetooth speaker to listen to music from my iPad and we ended up not listening to anything- just chatting as we felt like it. Imagine, companionable silence with your closest companion! Podcasts and audio books. On long trips my hubby makes sure I have the audio books downloaded lol great block and congratulations on being included. Love the possibilities of this block! On road trips I like to listen to Jazz stations or Classic Rock. If I should take cds, I would take classic old-time radio shows or jazz. We listen to music from the 50s, 60s & Motown on long trips - thanks to Sirius radio. Love your block. Anything I can sing along to, a lot of oldies. Love my Sirius radio because there's always something for my mood. I always have an audio book in my car...I love listening to epic books that I don't have the attention span to read like the Tale of Two Cities. Super great block, and I love your other patterns too! I like to listen to music and podcasts while driving, same while I'm quilting. The quilt done in the various blues does look like faceted gemstones. If you change to reds and burgundies you could have ruby's and in various greens to get emeralds. Lovely quilt. I love to listed to country music when I am driving. Just seems to make the day brighter. 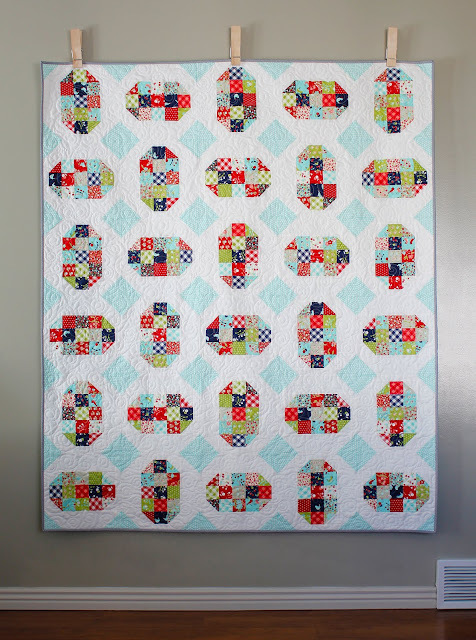 Love your block and both quilts! I usually don't listen to anything. It's my time to plan and think. Love the quilt in blues. I recently made a long drive and it was mostly talk radio to keep me going. Fun, fun, fun block! When I'm on a trip, I plug into an audio book and do handwork. Fantastic block! Thanks fir showing how it can be used! On road trips we listen to everything from news to drum corps music. What a fun block! I listen to oldies on the radio or the CBC radio Canada. When I'm driving by myself I listen to nothing. Add my husband it could be any radio station from Elvis Presley - reggae - smooth jazz. Love the block. On long road trips I usually try to find some somewhat local radio stations along the way, as I like to know what the weather will be. I usually try to find country music or oldies stations. I have enjoyed an audio book or two as well. I was looking at the quilt and I thought, I'm not loving it. And I say that because teal is my least favorite color in the world. But when I saw it in the prints, the quilt came to life. I love quilts done in prints and scrappy quilts are my favorites so now I can say I love it. On road trips, we listen to country and when a channel goes out, we search until we find another country channel. Love this "gem" of a block. I like talk radio when traveling, but my husband likes music. 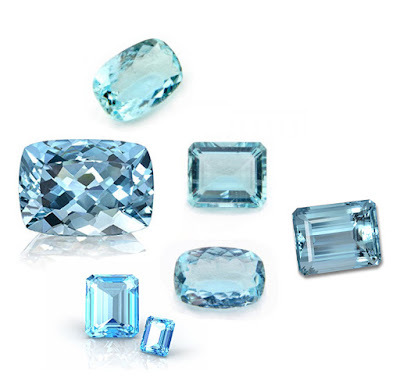 Aquamarine -- my favorite, probably because it's my birthstone. We got into the habit of listening to books while we travel. We especially love good thrillers but "The Martian" was probably one of our all time favorite road trip books. So much so that we listen to it at least once a year. We usually have the radio on when we are on road trips. Sometimes we will take cds with us. Lovely block and your patterns are beautiful. Thanks for a chance to win. What a fun way to show off lovely jelly roll strips! Tone-on-tone prints and blenders would really make the jewels sparkle! 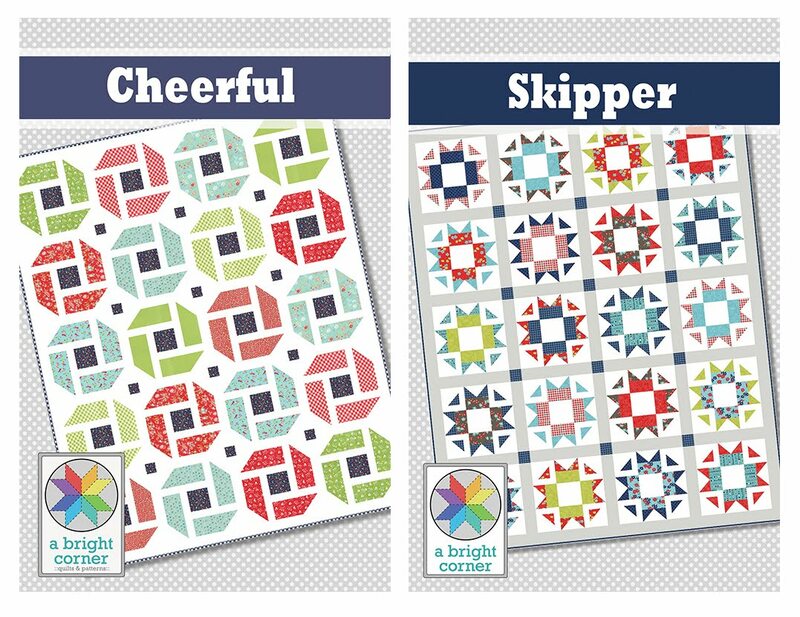 I've had my eye on the two patterns you are giving away--they are lovely! I love listening to anything. My husband loves putting together mix cd's with silly names, in genre-themed collections. We listen to the dvd's that play on the portable for our small sons during long trips. When we drive the canyon scenic loop, we listen to albums called "Two Steps from Hell", which is instrumental, symphony scores designed as trailer music for soundtrack scores...it's our favorite! Your block is great! I'd like to try it as a scrappy block. I listen to audio books when I am on a road trip! My daughter's birthstone is aquamarine and I think you have captured it perfectly. We listen to soundtracks mostly. From movies to Broadway, we find they are fun to sing with and they also tell stories at the same time. We like to alternate between the radio and our Ipod on road trips. I love to listen to audio books. For years I had a long commute to and from work. Audio books kept me sane, especially when traffic was bad and it took hours to get home at night. I like your block and the different colorways that you present it. Just makes me feel good. We live on an island so don't have many road trips. Husband wears a hearing aid and music isn't fun for him, but when I do listen, I like musicals...always something to sing along with. WE definitely like to listen to audiobooks. It is always a challenge to figure out which book my husband and I will both like, so we end up listening to books neither of us would probably read alone. Love your block. I never knew there were so many shades of aqua and blue. I enjoy listening to either audio books or podcasts while I drive. I also listen to them when I knit, quilt, or do housework. Multi-tasking at it's best! I love quiet on road trips but when the kids start fighting we've loved listening to the Narnia books on CD. I also have a great memory of listening to a book on CD about communication in marriage with my husband. It was enlightening to listen to it together and to have time to pause and talk about it. Audiobooks. Especially books that I read in print. just the radio, but when the teenager is with me I search for oldies stations, just to keep her engaged with me. I love listening to our spotify roadtrip playlist - lots of songs from the 1970s. I have even been known to boogie along in the passenger seat! I like rock and roll (50's songs) or country on the radio. I like the peace and quiet! Once bored...public radio. The only thing my husband and I can agree on in the car is 1980s rock and pop! Anything from Van Halen to Duran Duran. Thank goodness for Sirius XM! I kove audiobooks from my local library. I drive a truck and i tell everyone about overdrive which is an app used with most public libraries. Anyway, I also listen to music too. Ps...i adore tour patterns!! I like to listen to Carole King, Simon & Garfunkel, The Beatles, etc. Or, if I'm by myself, sometimes I do not listen to anything at all. Our road trips are loaded with lots of our favorite CD's in genres of all sorts - Contemporary Christian, oldies, soundtracks of broadway shows, Boston Pops, and more!! I like to listen to favorite Christian music CD's. Lovely work! I don't like road trips, so I usually just ride along listening to the hubb's favorite satellite radio stations. I may be going on a roadtrip next month! I personally love audiobooks, but with small children in the car we may end up singing along to Disney movie soundtracks. Either way should be fun!